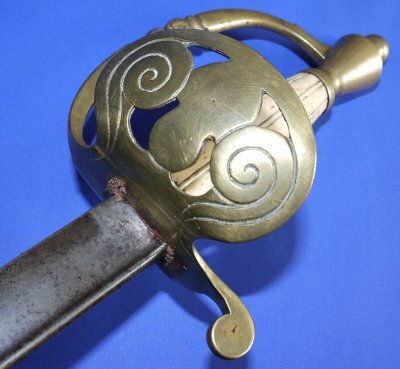 A rare Georgian / early Victorian British Honourable Artillery Company Officer's Sword with pipe back blade in good overall condition. 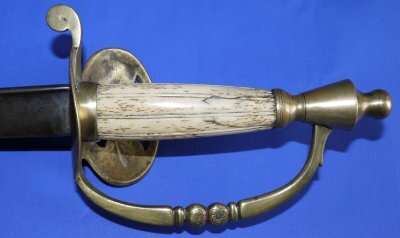 A very rare, almost certainly early Victorian version of the HAC pattern sword with pipe back blade, dating it to around 1822 / 1835. The grip is bone; it has been heat tested as part of our due diligence. The brass guard has been bent inwards but is sound; these are quite frail (brass guards). This is pre-silver flaming bomb attachment to the hilt (it never had one). The 32 1/2 inch pipe back blade is in good condition with a pleasing steady age patina throughout. Blade firm in hilt. 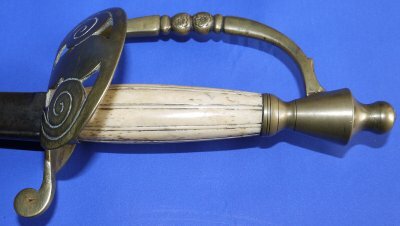 The hilt / guard is good but has been bent (we would not suggest trying to correct it unless done by a professional), though is sound (an average man's hand fits still). Bone grip in good order but with some age cracks. A HAC collector's dream. Snap it up quick for £450. Please quote item reference R79. Further / full sized images available upon request. Box 0558-1m (1.462).